A first sighting of an Imperial Moth has been recorded in Vernon County, Wisconsin, along the Mississippi River. According to our source, the moths appear to be making a slow progression northward up the river. It had previously been found in southern Crawford County, the county below Vernon. Have you found a moth or butterfly you’d like to report to someone? 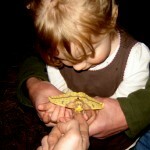 The USGS has a link where you can do just that… Please see http://www.butterfliesandmoths.org/faq/report for reporting instructions. The “Rarest and Cutest” Creature on Earth! 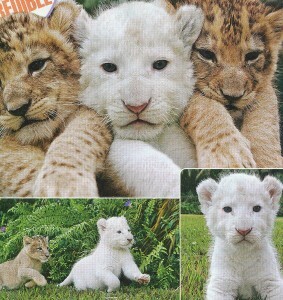 A White Phase Lion cub with siblings! You may know that I have a special interest in “white phase” critters on this earth. On a recent trip south, the airline magazine featured the “cutest and rarest creature on earth.” Guess what? It was a white phase LION cub. The article noted that it was not an albino, but a “white phase” LION due to a recessive gene.To recap, it takes TWO parents with recessive “white phase” genes to produce a “white phase” cub. Why a recessive gene in an African lion??? On a recent birding trip to Panama in December, I was priviledged to sit next to a Smithsonian scientist who had been studying tropical Panama for 30 years. He spoke of the difference between cold weather creatures and tropical creatures. The key word for mammals that must survive in temperate climates is ADAPTABILITY. Tropical plants and animals are experts in finding SPECIALIZED NICHES. Lions have not always been confined to Africa! More about that to come! Meanwhile, visit our new TRAVEL PHOTO site at www.greatriver.smugmug.com to see photos from the Panama Trip!